大部分免費的功能 安裝完成並啟動 後就能使用了.大概玩一下就知道是做什麼用的.這邊就不多介紹,不過 Firewall 這邊需要額外設定,來看一下 Firewall 要怎麼設定. To be as secure as possible, the Wordfence Web Application Firewall is designed to run via a PHP ini setting called auto_prepend_file in order to ensure it runs before any potentially vulnerable code runs. NOTE: If you have separate WordPress installations with Wordfence installed within a subdirectory of this site, it is recommended that you perform the Firewall installation procedure on those sites before this one. We’ve preselected your server configuration based on our tests, but if you know your web server’s configuration, please select it now. 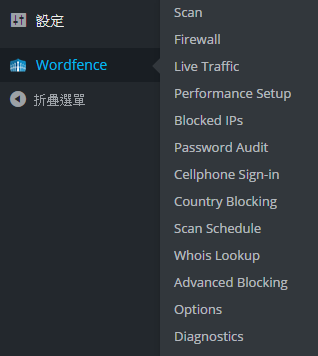 剛剛的 php 程式碼 wordfence-waf.php 需要再載入每一頁網頁前執行,所以要透過 auto_prepend_file 的方式來做. Enabled and Protecting: In this mode, the Wordfence Web Application Firewall is actively blocking requests matching known attack patterns, and is actively protecting your site from attackers. Learning Mode: In this mode, the Wordfence Web Application Firewall is whitelisting any requests that would normally be blocked by the firewall. Some requests contain data that may match patterns the firewall uses to detect attacks (such as an article about SQL injection that contains SQL code). While in Learning Mode, these requests will be whitelisted, excluding them from tripping the same rules once the firewall is enabled. Use this mode to prevent false positives on your site. Disabled: In this mode, the Wordfence Web Application Firewall is functionally turned off and does not run any of its rules or analyze the request in any way. 系統建議先選擇 Learning Mode 讓 Wordfence 學習一周.讓它先了解您的網站,這樣它就可以了解如何保護網站,以及如何讓正常的存取通過防火牆.而且一周後系統會自動轉換(需勾選 Automatically switch to Enabled Mode on)並啟用防火牆 (Enabled and Protecting). 目前遇到設定 Google AdSense plugin 要儲存時會顯示. 目前遇到 Enabled and Protecting 開啟時, Google AdSense plugin 會無法正常顯示出廣告,關閉 Wordfence 就正常了. 好像不是 Wordfence 的問題,感覺跟 Google adsense 比較有關.